RE: The Movietone story 1196/2 'English Canalways To Be Transformed', and PRINCE REGENT/BUFFALO. 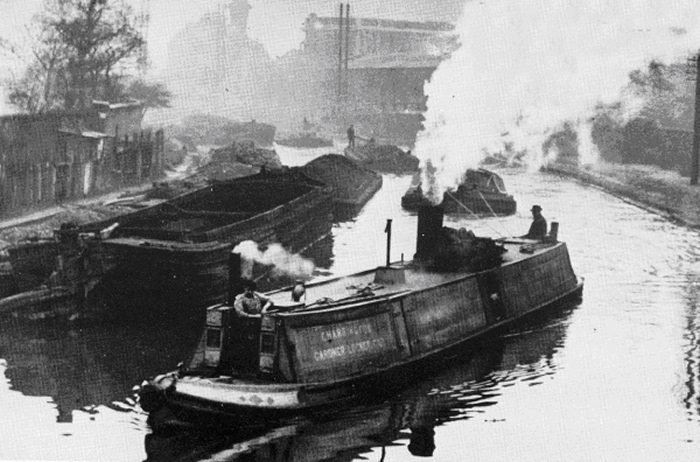 The image which appears in the Weaver's 'Steam on Canals' is indeed the same vessel in the same location on the Regent's Canal at Kensal Green approaching the former Gas Works basin (recently filled in) with coal barges in tow. This 'still', would 'appear' to have been shot from the bridge carrying the towpath over the entrance to the Gas Works basin. Behind the tug is a rather murky atmosphere through which no bridge across the canal can be seen, though there is a definite outline of a large building beyond. Slightly to the right of that, and directly above the second tow, is seen another building outline which still stands today, and is seen HERE. (Left click on the streetview and hold down, then drag right and left to view right and left). The film clip shows the same tug, same steerer with trilby, same woman (most likely) in the fore hatches with her arm now down, and probably the same tow. (Three long blasts on the hooter may have been to announce arrival to those supervising unloading). However, the location 'seems' to be a little different from the 'still'. The camera angle is from a slightly lower level and there is a raised section of towpath immediately outside what is now the Canal Activity Centre with extant dock beneath from which this could have been filmed. There is clearly a bridge in the background and beyond is seen what could be a chimney - but no outline of a large building as seen in the still. This location I feel is surely in the same spot between the Gas Works and Ladbroke Grove, but the surroundings look a little deceiving. If this were further back towards the Harrow Road bridge the curve of the cut and the adjacent buildings rule out most everywhere - except by the Gas Works - yet Ladbroke Grove bridge is not seen in the still. However, that it is Ladbroke Grove bridge in the film clip is certain, as the Kensal Green Cemetery building (a Chapel maybe) still stands and is visible on the left, set at an angle. The ramp leading down is still there, and if you backtrack to the previous sequence of the towed barges without tug, you will be able to make out the towpath and pipe bridge that takes both over the entrance to Marylebone Dock just beyond the bridgehole on the right. So I'll plump for both the still, and the film clip being taken from close by the Gas Works, and the amount of smoke and general filth in the air (perhaps some developing adjustment also) has created more of a puzzle with certain buildings 'disappearing'. The tug name. From the still it is impossible to see any name other than CHARRINGTON GARDNER LOCKET Co. But from the clip, not only do we see that, but more - albeit very fuzzy. There are a string of letters between the two side hatches (Bushell's BUFFALO had one set and a longer foredeck), and behind the engineer peering out is a name. Repeated viewings show it likely to be BUFFALO, but this is not the BUFFALO that appears outside Bushell's yard at New Mill - different boat unless drastically changed. Look carefully at what appears to be the name 'BUFFALO', is there a possibility that above and below those letters there have been previous words? Their length might also lead one to think they may have been the same length as the words PRINCE REGENT, rubbed out and replaced with the single name - BUFFALO. Did PRINCE REGENT get renamed? But perhaps that may be stretching it a bit! The only bridges that carry roads across the canal between Kensal Green Gas Works and Paddington Stop, carry; Ladbroke Grove; Great Western Road; and Harrow Road. There are three footbridges; Marylebone Dock; 'Halfpenny' (gone, but replaced with another); and the one by Blomfield Road. Harrow Road bridge is comparatively small, has brick abutments with a slightly curved cast iron side plates, and Great Western Road has a riveted Victorian span but a clearly long curved arch beneath. Ladbroke Grove is the most likely contender, and of which I have no visual image other than that available from Google Maps in local photographs. This shows the PRIDE OF SLOUGH (if you have visited Slough this vessel may seem appropriate) but more notably, the ramp and balustrade, along with an indication of a flat span, though nowadays topped with railings above the side plates. This, along with the cemetery building seat at 45° to the bridge, confirms to me the location of the film strip. The elevated point of view would be from that raised section in front of what is now the 'Canal Activity Centre'. This whole area was all gas Works - the 'Western Gas Works' according to my 1951 Greater London Atlas. No rail connection seemed to have existed for coal delivery despite being right next door to the GWR. Coal came by boat, tipped from the coal sidings at Marylebone (also long gone).